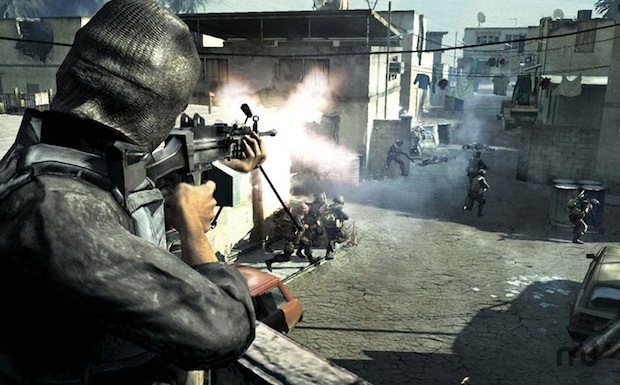 The highly acclaimed first-person shooter Call of Duty 4: Modern Warfare is on sale this weekend for Mac OS X gamers through MacUpdate Promo for just $23.99. For comparison, it’s $35.99 on the Mac App Store or $24.88 shipped from Amazon . If you buy the game through MacUpdate you’ll be able to download it instantly and play immediately, whereas the Amazon order is a physical box and has to ship to your door. I say save a buck and play now. I featured COD4 in my recent list of 6 of the best games for Mac that are on sale, and it’s now cheaper than the price was then by about $10. Same game, lower price, good deal. You’ll also want broadband internet access so that you’ll be able to play online, but of course you’d want that also if you’re going to download the game.